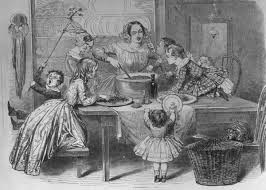 Christmas dinner takes a while to prepare whether in historic times or modern day. I believe the note below was probably used more by upper class, since pioneers often used venison as their main meat, but still find it interesting how little Christmas dinner preparations have changed. "Christmas Dinner This table should be laid as for any other company dinner, the necessary adjuncts being at had on the sideboard or another table, as heretofore directed. It is a modern fancy to introduce a centre cloth of embroidered linen, or squares and ovals of plush, on which the epergne is set; but practical housekeepers would generally prefer a low dish of ferns or scarlet geraniums mingled with white carnations, having for a base a round mirror whose outer edge could be hidden under a wreath of evergreen, and upon whose surface some stray leaves or blossoms have fallen as if by accident. In cities and towns, where raw oysters can be had, they are often used as a first course. They should be opened and the shell washed an hour or so before dinner, and be put in a cold place. When wanted for the table, if one has not proper oyster-plates, arrange six of these shells, with an oyster in each, on a dessert-plate, with the narrow part of the shell inward, all meeting in the centre, where two or three slices of lemon are laid. Small crackers are passed, in addition to the bread on the napkin, and the pepper and the salt should be within reach. The second course may be breaded mutton-chops, accompanied with canned French peas. A haunch of venison and boiled cauliflower, with drawn butter poured over the latter, would make an acceptable second course. The venison should be purchased several days in advance and hung in a cool place, and should be washed off five or six times with vinegar. On Christmas morning it should be washed with warm water, with a dash of cold water at the last. Then wipe perfectly dry and enclose it in a covering of dough made of flour and water rolled into a thickness of not more than half an inch. Encase this in two layers of white wrapping-paper and secure with a string. Fill a dripping-pan a third full of hot water and baste often, adding to it from the tea-kettle as it evaporates. Frequent basting will keep the paper from scorching; and when thoroughly cooked--which will require from two to three hours--take form the oven about three-fourths of an hour before dinner, remove all the coverings, rub well with butter and dredge with flour, and then return to the oven. Repeat this butter-basting two or three times, till the meat is nicely browned and a 'glaze' formed. Garnish the venison with alternate slices of lemon and pickled beet-root. Season the gravy with a large spoonful of currant jelly and the juice of half a lemon. Other suitable vegetables to be passed with venison are mashed turnips, mashed potato, or sweet potato. If a turkey is thought to be a necessity to complete the Christmas dinner, he should be prepared for the table as directed on page 119. When dished, it will be an improvement to garnish him with oysters carefully crumbed and fried. Cranberry sauce should be passed with roast turkey. Chicken salad may follow this course, cheese and crackers coming next. Everything save the ornamental centre- piece will now be removed from the table, and the crumbs brushed from the cloth, making the entrance of the mince-pies, fruits, nuts, and raisins now in order. Ices will be relished after highly-seasoned pastries, and light fancy cakes may be passed with them. Oranges, grapes, and the late pears are ordinarily offered, and last of all should com the little cups of black coffee, accompanied by cream and sugar. it should be of good strength, as we fully assent to the statement that 'well-bred and sensible people do not affect pale and watery decoctions after a hearty dinner.'" 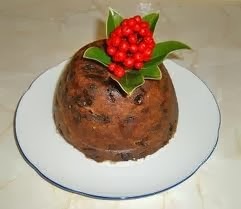 Courtesy of the oldfoodie.com is a Plum Pudding recipe to top of the celebration. As Christmas approaches, and we set our minds on our own Christmas dinners, I hope you've enjoyed this glance into the past. What do you include in your Christmas menu? 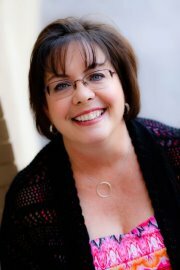 Comment to win a copy of Taming the Sheriff and a $10 Amazon gift card. May you have a blessed Christmas. 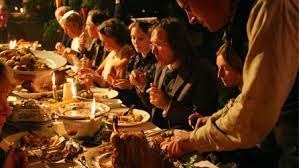 What a fascinating look at Christmas dinner during historic times. Our menu includes chicken and dressing, ham, sweet potato casserole, green bean bundles, cranberry sauce, rolls, and dessert. I wish you and your family a joyous holiday season! Looking at the past and reading about traditions families had is so interesting. Family gatherings were special then as they are now. Our menu is exactly the same as the reader above since Britney is my daughter. Our table is full and our blessings overflow. Happy Holidays to you and yours! This is such a wonderful posting, I cannot tell you how much I am enjoying your site. Fantastic history stories. Hmmm, well, I don't really have any recurring special dishes. I'm not the one that usually cooks the Christmas dinner, as my aunt likes to have everyone up to her house. They always require 2 chocolate cream pies from me, so although that's a tradition, it's not like a family recipe that was handed down to me. the email is now sending once a week which is frustrating. We always had a plum pudding for Christmas It use to have money in it. I actually have one for this year. the recipe mum used was what we call a depression recipe. It was one they used in the depression but its still nice. (this years is out of a tin and just enough for me for two meals as I will be home alone for Christmas). We now have the traditional Christmas dinner, but when my niece and nephew was younger we did not have the opportunity to see them often. They loved Mom's fried chicken, so we had to have fried chicken at a couple of Christmas meals. Thank you for the opportunity to participate in this giveaway. We all bring something to our Christmas dinner. It includes all the traditional things! I've always wondered how to make plum pudding!! Thanks for posting the recipe.